123 E 7th Street, East Village. This gourmet cupcake bakery and cafe offers up so many options to celebrate: order online ahead of time to be the most prepared, stop into the cafe for day-of celebrations, take a class to make the National Cupcake Day joy a year-round thing and learn the finer points of cupcake making, or book a party to celebrate espresso, maple pecan, honey cinnamon, caramel and cream cheese flavored snacks in the biggest possible way. 342 E 11th Street, East Village. Step into a real piece of New York City history with this Italian bakery. It’s been around since 1894, and we think their recipes should probably be trusted. Originally opened by a young Italian immigrant named Antonio Veniero, this place has been serving candy and espresso since before 11th Street had anything except billiards clubs. It’s still run by members of the Veniero family, and has a 100-person cafe that offers up every imaginable kind of sweet treat, including cupcakes, but with a touch of Italian flare. 9 Clinton St., Lower East Side. If you’re the kind of person who likes to liven up a meal with a little bit of alcohol, look no further. Boozy cupcakes at this hole-in-the-wall include Pretzels & Beer, Old Fashioned, Dark and Stormy, White Russian and Car Bomb. There are alcohol-free cupcakes, too, but even these are a little daring. L’Italiano has cranberry, rosemary and almond, and For the Love of Bacon combines toffee, bittersweet chocolate and bacon. While they may be best known for their face cookies, this quaint bakery offers up another kind of Instagram-worthy treat. Cupcakes with beautiful, flowery toppings, fresh fruit, and flavored icing. Did you really celebrate if you didn’t post about it on social media? This eatery makes their cupcakes fresh every day, and every single one of the 15 flavor combinations has a filling. Some are classics, like Funfetti and Chocolate Splash. Others are more unique, like PB&J and Raspberry Lemonade. 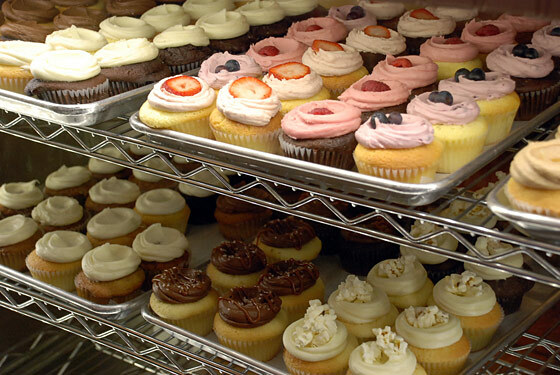 Cupcake lovers can also place orders for unique combinations online, and some gluten-free options are available. Dietary restrictions? No problem for this colorful bakery, owned by a Texas woman with a gluten intolerance. According to the website, she’s found a gluten-free substitute for almost every triggering food, and now wants to share her love of food with other people who have difficulty finding treats that they can eat. So, in addition to offering up gluten-free cupcakes, Tu-Lu’s also features vegan and dairy-free cupcakes, with a selection of flavors that changes daily.